I got this book for my brother Chris, a lover of diving and travel humor, for Christmas after a friend recommended it on Facebook. Having not read it and purchased it for title and cover alone, I decided to read a bit of it myself to make sure that it wasn’t a completely crappy Xmas present. No up-front intention of trying to tie it to natural security. 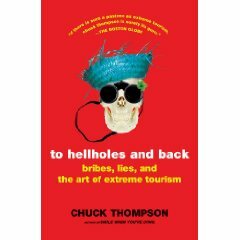 Try as I might to escape thinking about work, it turned out that To Hellholes and Back: Bribes, Lies, and the Art of Extreme Tourism by writer and editor Chuck Thompson had a few relevant passages. The premise of this book is that he travels to the four places on Earth he is most afraid to travel: the Democratic Republic of Congo, India, Mexico City and Walt Disney World. Thompson (sometimes directly and sometimes indirectly) drives home just how poor governance is in the DRC, though he describes this, war and corruption as almost systemic characteristics divorced of agency. This is travel writing, so there’s likely no reason to fully delve into exploring the causes of the country’s conditions, however I would bet a few dollars that any political science-y attempt to do so would do no better at fully satisfying curiosity as to why things are as they are. Pretty sad on its face, though as Thompson travels through India he realizes that with all the terrible conditions he finds, all is not totally hopeless. This reminded me of a conversation I had about a year and a half ago with two officials from Pakistan’s water and power ministry. One was deeply concerned about environmental issues, and particularly decreasing levels of drinkable fresh water. I asked about India’s increasing demands on shared river systems and the prospect of it dwindling Pakistan’s resources, and the second official replied with a shrug: “We’ve had water problems for hundreds of years, and we’ll keep having them for hundreds more.” He wasn’t too concerned at that time. In thinking through which natural resources issues have the potential to become security concerns specifically for the United States, it’s good to be reminded that most people in this world are acclimated to pretty harsh conditions – not a revelation obviously, but we do forget to contextualize too often in thinking through U.S. policy options. In this sense, Thompson’s book offers a valuable reality check that’s important for security analysis of any kind. Overall, even if not for natural security reasons, I highly recommend giving this book a read. And if anyone is still wondering from the first paragraph: yes, my parents named their children Chris and Christine. Photo courtesy of Holt Paperbacks.